Last weekend saw the Dartmouth men's crews travel to Worcester to battle both EARC rivals and some of the windiest conditions on record. Recaps of a big day of racing follow this weekend's previews below. After an open weekend and two solid weeks of training, the WOMEN return to competition at the Eastern Sprints on Sunday in Camden, NJ. Racing starts at 7:30am and goes until 6:00pm. The HEAVYWEIGHTS will finish up the busiest dual racing season in men's collegiate rowing with a trip to Syracuse to face the Orange, who finished 8th at the Sprints. Racing starts at 8:00 am. The LIGHTWEIGHTS concluded their season at the Eastern Sprints last weekend. I've mentioned that league racing has been surprising this season, and that I believed the guys would make their own contribution to the madness. They did so on Sunday. Our Chicago trip the previous weekend was exhausting, and its residual fatigue extended into last week. The Chicago racing also identified problems that we addressed with both a personnel change and lineup changes, moving from a straight starboard rig to a straight port setup. The squad handled the changes with maturity. Our heat pitted us against Brown, Cornell, Yale, MIT, and Georgetown. Improving on last year's finish meant making the petite final, which required finishing ahead of lower-seeded Georgetown and either MIT, who had just beaten us in Chicago, or Yale, who had taken the Olympic Axe earlier. The guys turned the heat into a race with Yale and MIT. The aim was to finish second or better. On the night before the Sprints, we talked about the nature of breaks, both good and bad. Sometimes bad breaks just happen. But good rowers tend to have agency in their good breaks-they help them happen or they recognize what's happening and act to make them better. Yale took a bad stroke in their opening twenty and our guys launched off the line well. The result was a three-seat lead on Yale, and the break the guys had waited for. They made it better with a move that left Yale almost a length down at the 750 as they (Dartmouth) pulled even with MIT. As other crews played defense against deteriorating conditions in the third 500, our guys attacked again to press ahead of MIT. They held their position to the line, reversing the outcomes of the Cochrane Cup and Olympic Axe, winning their three boat "race within a race," and advancing to the petite final for the first time since 2005. Racing began Sunday in Worcester with the 3rd Varsity Four. Dartmouth's 3V faced off against the MIT 2nd Varsity Four and Yale's 4th Varsity Four. The Four stormed off the line even with the leader Yale. By halfway Dartmouth slipped back off pace with the other two crews, eventually finishing third. The 2nd Frosh fell back four seats to the pack off the line. 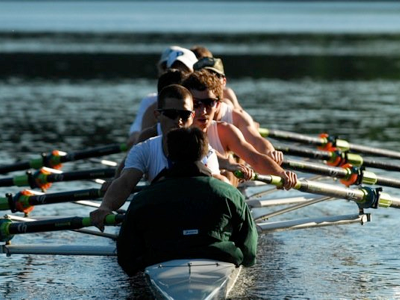 Dartmouth was not able to handle the quicker crews from Navy, Harvard and Penn. The 2F finished fourth, 8 seconds out of qualifying for the final. The 1st Frosh got off to a good start taking third in their heat with contact on first and second place. In the final Dartmouth got off to a quick start ahead of the field. However, pushed by the cross wind nearly out of their lane the rest of the field took 4 seats. Dartmouth recomposed and attacked, tracking down the leaders and nearly taking third place. But, in the final sprint Dartmouth did not have the kick they needed and crossed the finish line in 6th place, finishing one spot better than their ranking. Both the 2nd Varsity and 1st Varsity put out their best piece of the year, failing to make the grand final. The 2V had a three boat petite final with Columbia and Penn. Dartmouth and Columbia took the start leaving Penn behind. At 500m down Columbia pushed out to a 4 seat lead. Dartmouth responded and held the four seat margin for the next 700m, leaving Penn open water behind, as they got into a classic dogfight down the course. In the last 400m Columbia pushed up to Dartmouth's bow and took the lead for the last time finishing 3 seconds ahead of the Big Green.